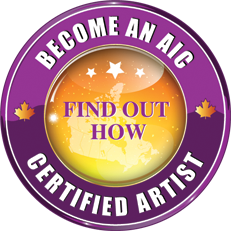 ArtInCanada.com was developed to help artists get more exposure for their art. It is intended for all audiences and age groups for viewing. Content on our website, supplied by an artist, is to be owned by the contributing artist. Artwork that is not by the artist can not be uploaded by the artist. Artists can not upload any work this is unlawful or threatening, misrepresented to the viewer, scandalous, obscene, or pornographic in our sight. We reserve the right to remove artists or art that don’t meet our terms. Art In Canada Inc. can’t promise this website is free of errors, but we will strive for information to be up to date and correct. We can not promise there won’t be service interruptions from time to time, due to situations that might be beyond our control. Memberships fees and advertising fees are not refundable. You may cancel your yearly subscription at any time. Your homepage and additional advertising will remain on the site until your membership ends unless you let us know you want your information deleted sooner. Art In Canada is not responsible, nor will be liable for damages caused by viruses or any other contamination or features that might affect your computer. That being your computer equipment, data, all software or any other property on your account. We are not responsible for any downloads you may do from the website or linked websites. The copyrights to all original materials, being website content and intellectual property, including visual interfaces, images, design work and all computer software and codes done in the development of this website belongs solely to Art In Canada Inc. Do not copy or reproduce content from this website or any art from this website without first contacting and getting permission from the website owner Lynda Baxter, or in the case of artwork, you must contact and have permission from the artist before any use of their copyrighted material that has been uploaded to this website. Art in Canada Inc may at some point, modify this website, or discontinue this website without any prior written notice to artists who are on the site, or viewers who view the site. You agree to defend, indemnify and hold Art In Canada Inc. harmless from and against any and all claims, that being, any damages, costs, and expenses, including attorney’s fees, arising from or related to your use of https://www.artincanada.com/.